Hotel SixtyTwo, Barcelona. SixtyTwo Hotel Barcelona. 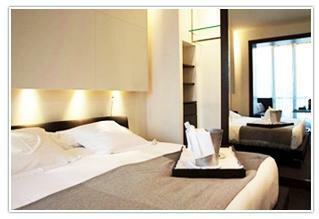 The SixtyTwo hotel in Barcelona is a very refined boutique hotel located in the famous shopping street Passeig de Gracia. It has been designed by the architects Josep Juanpere and María Vives, with their taste of minimalist design and oriental inspiration in all its 45 rooms and suites. You will enjoy a warm atmosphere as well as a technological service, like televisions, telephones, taps, particular bathroom products, I-pod stations and Nespresso coffee machines. There is also the wi-fi connection. After a hard day, nothing is better that a drink in our hotel lounge, where you can relax and listen to the music. Otherwise, always to relax, a massage in your room is ideal. For those who instead love Barcelona by night, we have many bar, restaurants and clubs to suggest you! For those who like room service (from 7:30 to 23:00), our chef our chef has selected the best market products for exquisite dishes. For business men, we propose free Internet access in the Business Centre, as well as Internet-Wi-fi connection.